In order to qualify as a court certified diminished value expert, an appraiser must have testified as an expert witness in a court of law. 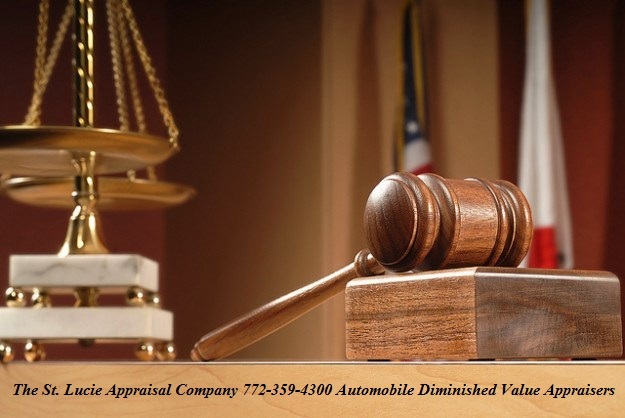 Whether the automobile diminished value case was heard in a county, state or federal court, an appearance and subsequent acceptance as an expert in the field provides an appraiser with the necessary credentials to be so recognized. We have testified in civil trials involving auto diminished value both in person and via teleconference. As a court certified diminished value expert and licensed independent adjuster and appraiser, our opinions are a valuable tool in helping claimant’s attorneys present effective arguments to show the existence and amounts of diminished value. As automobile diminished value settlements can reach into the tens of thousands of dollars, providing irrefutable testimony is crucial to success. 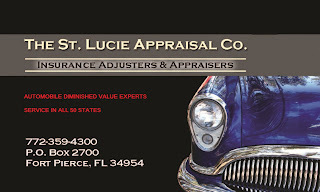 The St. Lucie Appraisal Company is perhaps the only automobile diminished value appraiser that takes the time to establish the amount a vehicle has lost after collision repairs by obtaining multiple dealer quotes. Insurance company defense attorneys only offer reports based on formulas or generic auto auction results that pale by comparison. We do the work and the results speak for themselves. It is for that reason that insurance adjusters rarely downgrade our automobile diminished value reports as much as those of other independent appraisers in the field. The best possible result for someone making an automobile diminished value claim is to receive a fair settlement offer without the necessity of going through a civil trial. Insurance company adjusters are knowledgeable enough to recognize whether a claimant’s independent appraisal has a chance to succeed in front of a judge or a mediator. Diminished value reports based on algorithms, formulas such as State Farm’s Rule 17-C and other similar methods that use modifiers are difficult to understand – both for a lay man and a judge. And the use of automobile auction results to determine a particular vehicle’s diminished value has been widely recognized as being too generic. Those types of short cut methods are the reason The St. Lucie Appraisal Company is called upon so often to offer second opinions. Nobody should have to pay for more than one diminished value appraisal but, unfortunately, that is sometimes what it takes to obtain a fair settlement from an insurance company. 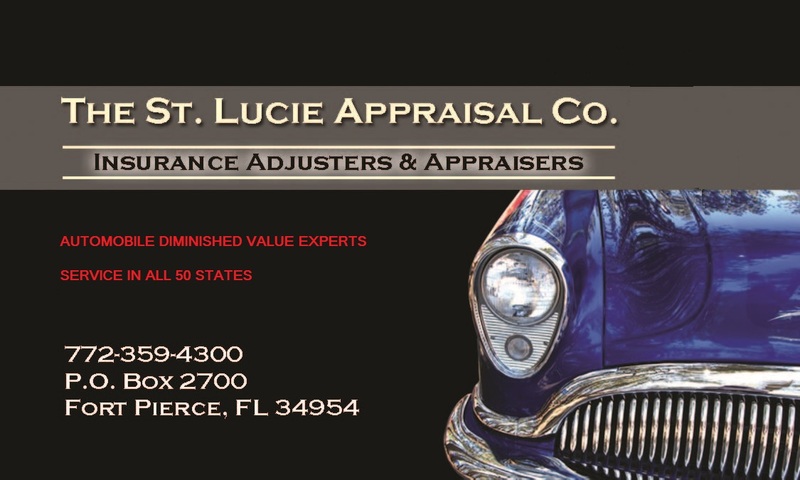 The St. Lucie Appraisal Company is proud to offer automobile diminished value reports that rely on the actual opinions of new car dealers as to how much value your car has lost after accident repairs. If you own a Lexus and live in Alabama, your report will contain quotes from six Lexus dealers in and around Alabama. We are licensed appraisers which is the most valuable credential in the eyes of the court. Other appraisers that advertise themselves as “certified” or “accredited” simply belong to pay-for-membership organizations. And in addition to providing the most comprehensive automobile diminished value reports, as a court certified diminished value expert witnesses, hiring us furnishes claimants and their attorneys with a fully reliable product.